Sen. Jeff Flake, R-Ariz., said Wednesday that he will not vote to confirm President Donald Trump's pick to lead the CIA. 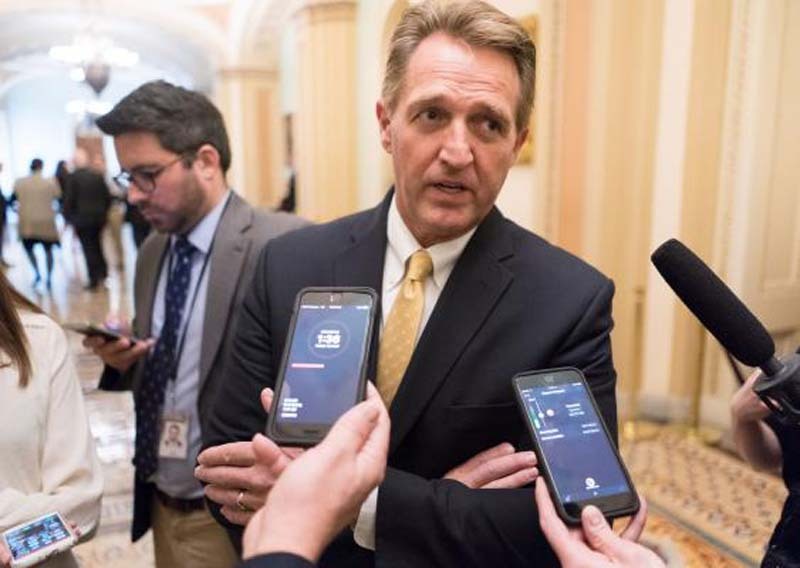 Flake is the third Republican Senator after Sens. John McCain, R-Ariz., and Rand Paul, R-Ky., to say they will vote against the confirmation of Gina Haspel due to her role in the CIA's now illegal torture program. "I will vote 'no' on the Gina Haspel nomination," Flake said in a statement. "While I thank Ms. Haspel for her long and dedicated service to the CIA, as a country we need to turn the page on the unfortunate chapter in the agency's history having to do with torture. Congress needs to be able to provide fully informed oversight. My questions about Ms. Hapel's role in the destruction of videotapes relevant to discussions occurring in Congress regarding the program have not been adequately answered." Although three Republicans have said they plan to vote against Haspel's confirmation, at least five Democrats have said they will vote in favor of Trump's pick to lead the spy agency. Haspel's nomination has been marred by her involvement in the CIA's torture program, which involved detaining suspected terrorists without due process and using torture techniques to obtain information. Haspel denounced the torture program in a latter to Sen. Mark Warner, D-Va.
"While I won't condemn those that made these hard calls, and I have noted the valuable intelligence collected, the program ultimately did damage to our officers and our standing in the world," Haspel wrote. Warner, who criticized Haspel for her involvement in the program, is one of the Democrats who said he would vote in favor of her conformation.